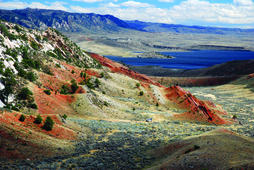 Seminoe State Park in south-central Wyoming is the focus of a new pamphlet published by the Wyoming State Geological Survey (WSGS). The pamphlet is the second in a series depicting geology in Wyoming's many state parks. The first publication highlights Curt Gowdy State Park in southeastern Wyoming. 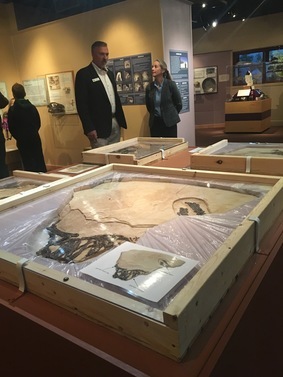 WSGS Director, Dr. Erin Campbell, says the publication series is aimed at increasing visitation to the parks while also helping visitors understand the geology around them. "Seminoe State Park has some of the most spectacular geology in the state," Campbell says, adding, "It's rare to have such a complete geologic section, from Precambrian to Cretaceous rocks, so beautifully exposed and easily accessible." The pamphlet includes a geologic map of the area, information about the park's rock formations, and its hydrogeology. Pamphlets are free and available at the WSGS office on the University of Wyoming campus in Laramie, as a download from the agency's website, and at their respective park's visitor centers. Pamphlets now in production will focus on Glendo, Guernsey, Buffalo Bill, and Keyhole state parks. Earlier this year, the WSGS had a rare mammal fossil prepared for future scientific evaluation. The fossilized tapiromorph specimen was discovered near Kemmerer, Wyoming, and is the largest known mammal fossil ever found in the 50-million-year-old Green River Formation. It's also the first of its kind found in the geologic formation, potentially is the only one of its kind, and may support a North American origin of tapiroids. 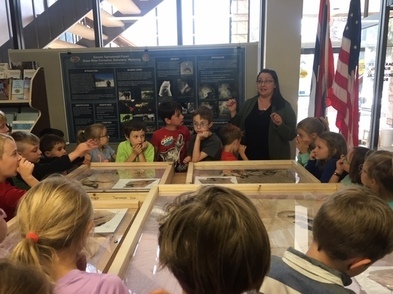 More than 400 people turned out for a weeklong open house at the WSGS to see the tapiromorph fossil, and another 50 attended an event at the Wyoming State Museum in Cheyenne. The fossil will remain on display at the state museum this winter. To learn more about the specimen, visit the WSGS website. 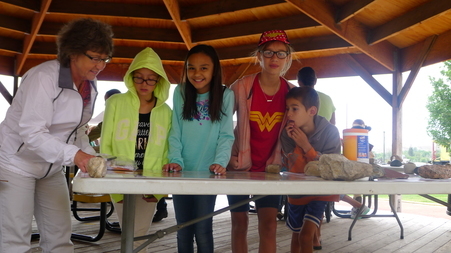 The Latorre family, with help from WSGS map editor, Suzanne Luhr, learned about ages of rocks throughout Wyoming during the August Rawlins Territory Celebration. The event was in celebration of the 150th anniversary of Rawlins, Sinclair, and Fort Steele. WSGS staff held activities about the geology in the area. 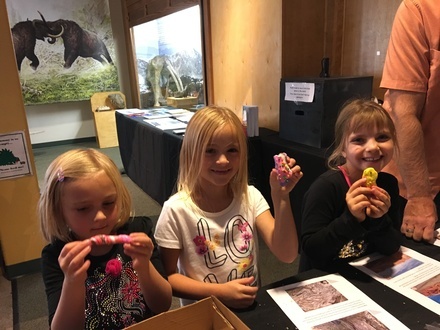 The Cuadrad sisters, Ayla, 6, Abi, 7, and Kami, 8, used candy to learn the three rock types during the October "Wyoming ROCKS! The Art of Our Geology" event the WSGS co-hosted with the University of Wyoming Geological Museum in celebration of Earth Science Week. A lot has changed at the WSGS in the last 40 years. Directors have come and gone. Old technology has been replaced with the latest and greatest. The agency’s name is different. Something that has remained the same in those four decades is Phyllis Ranz occupying the northeast corner office on the middle floor. 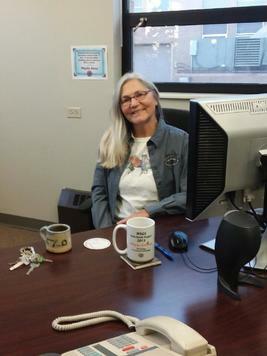 That was until Oct. 1 when Ranz, who worked in GIS Resources at the WSGS, retired. Ranz was attending the University of Wyoming, enrolled in architectural engineering, when the Survey hired her. Ranz says the biggest transition that has transpired during her tenure is how technology has affected map production and the delivery to the public. In the beginning, staff drew by hand geologic maps and released them to the public as hardcopies. Today, maps are created on the computer and are available as a free download, also on the computer. Forty years is a monumental milestone to reach for someone with one employer. But for Ranz, it hasn’t been too hard. She’s also enjoyed the steady work flow, including contributing as a team member on various projects by developing geodatabases, and digitalizing and creating map layouts. She applied her skills with a host of computer programs to complete various tasks related to geologic maps, publications, and images. She also assisted the agency when it moved hardcopy files to digital format. Ranz says she is looking forward to retirement, which includes spending time with her grandson and catching up on her many hobbies. “I also plan to visit places I’ve never seen in my home state of Wyoming,” she says. Ranie Lynds, geologist and manager of the Survey’s Energy and Minerals Division, gave a talk to the Geologists of Jackson Hole group Oct. 2. Roughly 70 people attended to hear Lynds’ talk, “Unraveling the Geologic History of the Greater Green River Basin in Wyoming.” A recording of her presentation can be found on YouTube at: https://www.youtube.com/watch?v=ha_gfHhZLLA. 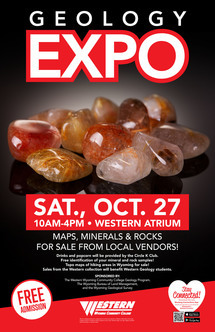 If you are going to be in Rock Springs on Saturday, Oct. 27, stop by the Geology Expo at Western Wyoming Community College. WSGS geologist Jesse Pisel will be there with Wyoming maps, rocks, and minerals. He will have rock samples to give away and show how all of our publications can be downloaded from our website for free. The event is in the college's Atrium at 10 a.m. to 4 p.m. Admission is free. Sponsors of the event are the Western Wyoming Community College Geology Program, the Wyoming Bureau of Land Management, and the WSGS. More information about the event can be found in this news article: https://www.sweetwaternow.com/join-westerns-geology-program-at-the-geology-expo/. The following are publications and products released by the WSGS in 2018. Looking for something specific? Check out our new publication search on our website.